Background: Advance care planning is seen as an important strategy to improve end-of-life communication and the quality of life of patients and their relatives. However, the frequency of advance care planning conversations in practice remains low. In-depth understanding of patients’ experiences with advance care planning might provide clues to optimise its value to patients and improve implementation. Aim: To synthesise and describe the research findings on the experiences with advance care planning of patients with a life-threatening or life-limiting illness. Design: A systematic literature review, using an iterative search strategy. A thematic synthesis was conducted and was supported by NVivo 11. Data sources: The search was performed in MEDLINE, Embase, PsycINFO and CINAHL on 7 November 2016. Results: Of the 3555 articles found, 20 were included. We identified three themes in patients’ experiences with advance care planning. ‘Ambivalence’ refers to patients simultaneously experiencing benefits from advance care planning as well as unpleasant feelings. ‘Readiness’ for advance care planning is a necessary prerequisite for taking up its benefits but can also be promoted by the process of advance care planning itself. ‘Openness’ refers to patients’ need to feel comfortable in being open about their preferences for future care towards relevant others. Conclusion: Although participation in advance care planning can be accompanied by unpleasant feelings, many patients reported benefits of advance care planning as well. 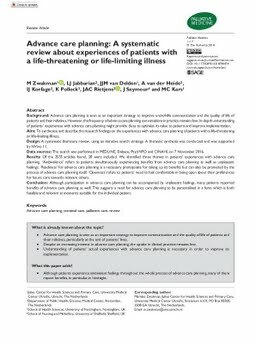 This suggests a need for advance care planning to be personalised in a form which is both feasible and relevant at moments suitable for the individual patient.